Whenever you download a new application from a third-party website, you have to read all the installation steps carefully; otherwise you would risk installing the likes of Boxed Books on your computer. This program is not a malicious security threat. It is categorized as adware, which means that Boxed Books collects data on your web browsing habits and then spams you with commercial advertisements when you access supported websites. It is definitely more annoying than dangerous, but if you care about your system’s security, you will remove Boxed Books from your computer as soon as possible. You probably won’t even notice at first that Boxed Books is on your computer. Even though this program requires user’s permission to get installed on the target computer, most of the time, users do not realize they install this application willingly. Boxed Books will manifest itself when it begins displaying commercial pop-ups in online stores. If you are wondering why you are constantly spammed with various commercial ads, open your browser’s settings and check whether you have Boxed Books extension on the list. If so, then the answer is clear. 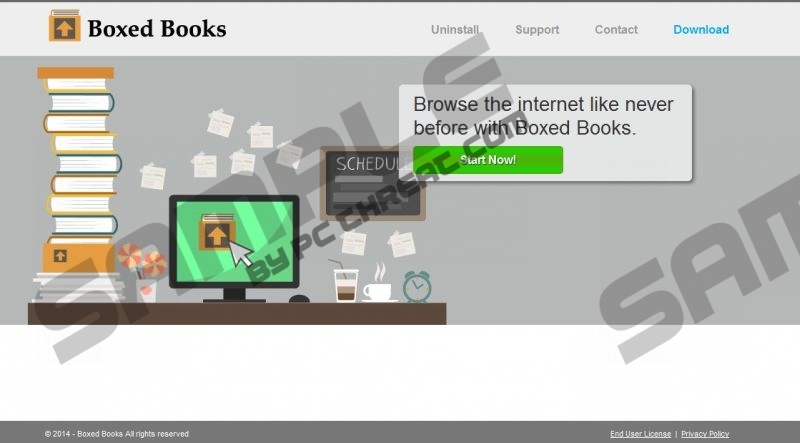 Boxed Books behaves just like any other adware application from the SuperWeb family. Its functions are identical to those of Key Lime Lizard, Rad Rater, Browser Nail, and others. Boxed Books also has an official homepage via boxedbooks.info, but the download button there does not work. If you click it, you get redirected to a blank new tab. Hence, the only way for this application to get around is through bundles. Users are discouraged to indulge in freeware installation, especially if the programs in question are downloaded from third-party websites. You can never know what additional programs will be installed on your system, and how hard it can be to remove them. The best way to protect yourself and your computer from malicious infection is to remove Boxed Books right now. When you uninstall this application via Control Panel, run a full system scan with a licensed antispyware tool. A full system scan will help you determine whether your computer is absolutely safe and clean. If that is not the case, do not hesitate to acquire a legitimate computer security application. Select Uninstall a program and remove Boxed Books. Go to Uninstall a program and remove Boxed Books. Select Add or remove programs and uninstall Boxed Books. Quick & tested solution for Boxed Books removal.